Legacy Youth Tennis and Education is a non-profit organization offering various programs to train their participants to become competitive athletes, as well as confident, well-informed leaders. The organization offers community-based events, homework help, and life skills workshops in order for their participants to become engaging, well-rounded individuals. Legacy is an outlet and haven for their participants to learn, grow, and stay active in a safe, nurturing environment. The ultimate goal for Legacy is to increase their revenue and participation in the organization. To do so, it became imperative to form a social media strategy in which Legacy can diversify their different platforms. Legacy had the goal of improving their current social media practices in order to become more competitive amongst other related organizations in the Philadelphia area. To do so, they will need to make the advantages of Legacy and their programs more well known, and emphasize what sets them apart from other programs in the community. Once the research and strategies are discussed, it was also important to find an execution plan that is reachable for the limited resources that Legacy has. After performing a background and social media analysis of Legacy and their competitors, we were able to identify the organization's strengths and weaknesses online. This led to a facilitated brainstorming session with the Legacy staff to develop ideas for a social media campaign. 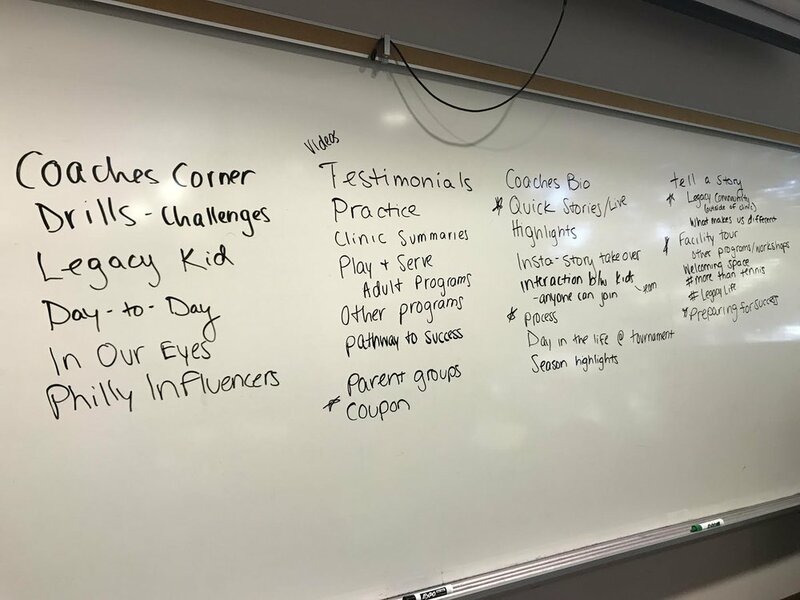 As a team, we gathered the most valuable ideas that would help effectively tell a story about the participants and programs that Legacy offers while maintaining a competitive edge. These ideas were transformed into a campaign with social posting strategies for multiple platforms including Facebook, Instagram, Twitter, and Youtube. After meeting with the Legacy team, we produced researched reports based on their current social media practices while applying critical storytelling techniques. Legacy plans to use this information to improve their online aesthetic with the ultimate objective of increasing revenue and participation. Based on our background research and social media analysis, we expect to see positive changes and progressions within Legacy’s social media accounts. Through our proposed social media campaign, Legacy will be responsible for producing more frequent, diverse, and relevant content on their social media platforms. Within this content, Legacy will be emphasizing what sets them apart from other tennis organizations. We expect to see an increase in followers, likes, and shares across all social media platforms in addition to more players joining the #LegacyLife.